The Cleopatra Bracelet is made with moonstone beads, silver beads, antique silver separator beads and silver caps. It measures 18cm with 4cm extender chain. Every order will be gift wrapped, ready for gifting. For a shorter or longer chain, do contact me & I'll customize it to your preferred length. Inspired by William Shakespeare's The Tragedy of Antony and Cleopatra. 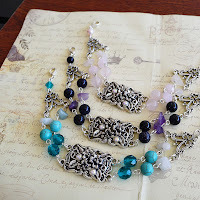 The Cleopatra Necklace is made with silver beads, antique silver bead separator, crystal beads, moonstone beads, an antique silver pendant that's embedded with resin and flecks of metallic foil that mimics the look of stained glass. Inspired by William Shakespeare's star-crossed lovers, Romeo & Juliet. This necklace is made with silver beads, silver bead caps, antique silver portrait of a lady charm, and an antique silver pendant that's embedded with flecks of metallic foil that mimics the look of stained glass. Inspired By The Myths & Legends Of Dragons. This Mythical Dragon Keychain is made with Czech rhinestone and bead, a skeleton key that's embedded with flecks of metallic foil that mimics the look of stained glass and an antique brass dragon charm. This silver tone bookmark comes with a dangling dragon scales charm embedded in an antique silver setting. Available in 4 different dragon scales colours. "Making the best of this life, one spoon at a time." This silver tone bookmark comes with a Czech fire polished bead and an antique silver royal spoon charm. "A book is a dream that you hold in your hands." This Knowledge Is Key Bracelet is made with blue cat eyes beads, moonstone beads, crystal rhinestone beads, acrylic beads, antique silver beads, book charm, key charm, love charm and a dangling aquamarine Swarovski Elements helix crystal bead. "Be in your own Wonderland." This Cat On The Moon Vintage Bracelet is made with blue cat eyes beads, gemstone beads, acrylic beads, lucky clover charm and a whimsical cat on the moon antique brass charm. Inspired by dark nebula, an interstellar cloud made up of gas, plasma and galaxy dust which can sometimes obscure light from background stars or a reflection nebula creating irregular shapes that have no defined boundaries. This Dark Nebula Bracelet is made with blue sandstone beads, cat eyes beads, moon charm, star charm, crystal rhinestones & beads with a dangling Swarovski Vitrail Medium crystal heart pendant. It measures 18cm with 4.5cm extender chain. "The idea of my life as a fairy tale is itself a fairy tale." Inspired by the classic, old hollywood style of Grace Kelly, famously known as Princess Grace of Monaco. This Old Hollywood Pearl Necklace is made with glass pearls, antique silver spacer beads and a dangling crown charm with Zirconia rhinestone. It sits close on the neckline and measures 40.5cm with 4cm extender chain. "The pearl is the queen of gems and the gem of queens." Inspired by the classic, old hollywood style of Grace Kelly, famously known as Princess Grace of Monaco. This Old Hollywood Pearl Bracelet is made with glass pearls, antique silver spacer beads, antique silver key charm and a dangling crown charm with Zirconia rhinestone. 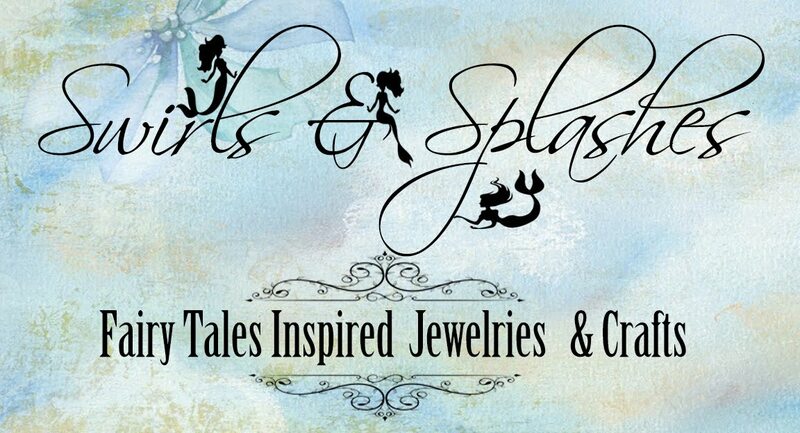 Created by a self-taught jewelry artist who loves everything magical, enchanting & ethereal. 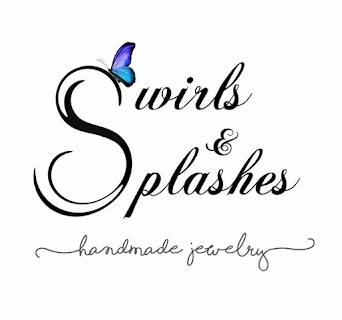 Swirls & Splashes handmade jewelry & crafts leans heavily towards Gothic, Pre-Raphaelite & Romanticism style.